Ok. Here's weird, I can't remember if I've been to Mt. Mitchell or not. I do remember that my friends and I wanted to do a cross-country trip across Australia and the Pacific Rim, which then became a possible cross-Canada train trip, which then became a possible cross-US RV trip, that then ended up as a cross-theUSSoutheast roadtrip. But, I want to say it was on that trip that we went up Mt. Mitchell. Or at least, I think it was Mt. Mitchell. 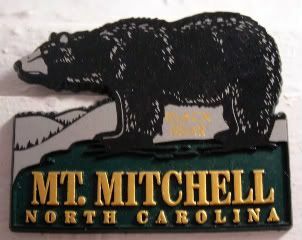 I remember lots of National Park elevation signs, and taking pictures of the lot of us in front of those signs. I remember numbers, but for the life of me, I can't remember if the name above the elevation was Mt. Mitchell. Hmmm. Anyway, using this for today's magnet, because I'm quoting one of my colleagues, who for some reason always has the best bear quotes. Yesterday's quote, after a particularly challenging day was, "Sometimes you're the bear. And sometimes you're bear food." Love that. Mind you, jury's out on which one I'll be before these couple of weeks are through.